“I loved it.” Those were the words that immediately and emphatically erupted from the mouth of a young African American boy of about 11 whom I had just asked, “What did you think?” of Holler If Ya Hear Me, the new Broadway Hip Hop Musical, which is based on the poetry and music of Tupac Shakur after we both saw the opening in BroadwaysPalace Theater on June 19th. I didn’t know the child and was immediately shuffled away from him by the crowd, but his was the opinion I most wanted to hear; it mattered the most. Whatever you may think of my reflections below, which will be one of the only reviews of Holler you will read by a black woman unless – as I hope – other black women attend and write about the play, or whatever you think of the reviews by the predominantly white and male reviewers elsewhere, please remember that this black manchild’s rapid “review” of Holler If Ya Hear Me is the most important that you will read about the musical. He loved it. We rarely ask black children what they think about theater – or about anything else for that matter – because they so rarely have the opportunity to attend theater productions, especially on Broadway, not only because of the expense but, also, because they are so rarely inspired by theatrical representations that engage experiences or ideas that speak to them. Holler If Ya Hear Me spoke to that young man. The play hollered, and he heard it. In a culture that frequently dehumanizes black people of all ages and ignores the voices of young people of all ethnicities,Holler If Ya Hear Me represents an exciting and important moment in contemporary popular culture, a moment when Black men’s voices, humanity, and deep existential longing for peace of all kinds literally take center stage and hold it. Like the Hip Hop music and culture that serves as its foundation, Holler If Ya Hear Me, is powerful not only because of the intriguing work of art that it is but, also, because of the intriguing discourses that it has the power to inspire. The enduring symbol associated with Tupac is that of “the rose that grew from concrete” from his most famous poem and the title of his book of poetry. It is the visual symbol on the musical’s playbill and posters and an apt image of the musical itself, a beautiful rarity – though one hopes it will become more common – Hip Hop musical theater blossoming on Broadway. Holler If Ya Hear Me tells the story of black men who perform conflicted narratives of peace, violence, freedom, entrapment, loyalty, betrayal, suffering and redemption through Hip Hop and Hip Hop-inspired rhyme, song, speech, and dance, which are all based on the poetry, rhymes and music of Tupac. The male characters themselves are engaged in an ultimately disastrous emotional dance with and against each other as parents, children, brothers, and friends. The early death of one young Black male character is the catalyst for the entire community to musically debate the price and power of peace, both psychological and social. Holler was written by Todd Kreidler and produced by Kenny Leon, who just weeks ago won a Tony Award for directing A Raisin in the Sun. This is a significant coincidence as Holler is a theatrical heir to Raisin, which was originally performed on Broadway in 1959; like Raisin, it is a social allegory about what it means to try to make good choices for one’s self and one’s family as a man, and specifically, a black man, in the face of bad, and sometimes, dehumanizing, social, economic, and racial circumstances. The story is built around contemporary African American male archetypes that are saved from stereotyping by compassionate characterization in the directing and writing and by the multidimensional performances of the actors. The central characters are estranged former friends, a successful street hustler played with charming nuance by Christopher Jackson, who was in In The Heights, Broadway’s last major foray into Hip Hop Theater, and an ex-con performed with masterful elegance, depth, range, and power by Saul Williams whose dynamic yet subtle and disturbing performance is one of the most compelling acting events of the year in any medium. His performance of the play’s title song is so visceral and thrilling that one begins to imagine his character as a different version of Tupac in another life, a failed genius, one who never becomes famous but who just as compellingly symbolized the emotional ethos of a generation of young men. If the Tony’s ignore Saul Williams’ performance next year, fans of the performance need to stage a Hip Hop protest and holler if they don’t hear us. The inclusion of the one “white best friend” is a suitable response to the countless films and television shows in which there is one “black best friend.” However, the white male character, portrayed by an appealing Ben Thompson, plays an essential role in the plot. The musical is elevated by the beautiful voice, presence, and performance of Saycon Sengblohand grounded by the always magnificent Tonya Pinkins, whose performance in Caroline or Change remains one of 21stCentury Broadway’s most remarkable. Given Pinkins’ artistry, one regrets that Holler does not give her more to do. Supporting the leads is a cast of gifted young actors who provide not only a backdrop of pure talent but, also, give depth and pathos to the theme of a community in crisis. Collectively, all of the performers sing, rap, and dance the roof off of the Palace Theater, and it doesn’t come down until the curtain falls. Although there are many tragic elements of the story Holler tells – which some reviewers have, mistakenly, found cliché – the exuberant performances of Tupac’s poetry and music infuse the entire production with intense cultural and artistic joy, a pleasure which is, for Hip Hop heads and Tupac fans, sublimely nostalgic. Yet one does not have to be a Tupac fan or a Hip Hop head to appreciate Holler. Holler has been described as a “jukebox musical” because like other musicals such as Mama Mia (Abba), American Idiot (Green Day) it is a play whose music is inspired or derived from pre-existing popular music recordings. As is the case with those musicals, one need not be a fan of the original recordings, or even of Hip Hop music or culture, to appreciate their reinterpretation and application in a new musical theater context. In fact, those who think they do not like Hip Hop music may be surprised when they see and hear Holler by how beautifully Hip Hop can be adapted to a musical theater context, a fact that Hip Hop theater artists discovered decades ago. Holler is not without its flaws. Despite their wonderful performances, including their delicious performance of “Keep Ya Head Up” as a musical feminist critique of the young men’s performance of “I Get Around,” the talented women of the cast are under-utilized by the production. The representation of black women characters as admired but marginalized emotional accessories to more fully developed black male characters is a recurring weakness in some media by and about black men, and Holler is no exception. However, the acting, singing, and dancing of the women in this cast is so phenomenal that one almost forgets the problem of their limited role in the narrative. Almost. The women’s sensational performance of “Keep Your Head Up” is artistically and rhetorically successful, yet one misses the power of a black man displaying deep empathy towards black women that Tupac expressed in the original recording. Tupac fans will debate the inclusion or exclusion of various songs and poems. In keeping with my disappointment about the gender dynamics of the play, I longed for the inclusion of “Brenda’s Got a Baby,” one of Tupac’s most vividly theatrical songs. Multiple performance planes, a revolving stage, and creative projection design elements added dimension to visual production dynamics that were, in some scenes, excessively minimalist. Given the global aesthetic wealth of the Hip Hop dance medium and the casting of remarkable dancers, the choreography would have benefited from a broader range of Hip Hop dance elements. Nevertheless, the intensity and vitality of the performances outweigh these weaknesses. In Holler, Tupac’s poems, both musically recorded and written, retain and renew their power because they speak so compellingly about central intellectual and emotional challenges of humanity in general and masculinity in particular. 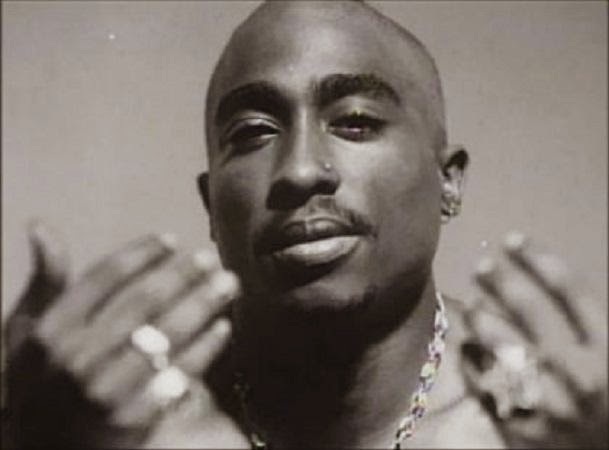 While those of us who write about Tupac often address the contradictions between his aggressive, hyper-masculine “Thug Life” persona and his sensitive, vulnerable “Rose from Concrete” poetic spirit, perhaps his true power is that he candidly, courageously, and relentlessly exposed and excavated the sensitivity and vulnerability that the aggressive hyper-masculine stance struggles, sometimes violently, to conceal. Holler recognizes and performs this revelation, peeling – sometimes ripping – away the hard layers of each young male character to reveal their fragile human cores. In addition to its contributions to the evolution of 21st Century musical theater, it is useful to consider Holler as a testament both to the allegorical ethos of Tupac’s artistry and to the significance of Hip Hop Theater as an important genre of both Hip Hop Culture and of World Theater. Although Tupac, the historical figure, is not an embodied character in the musical, through his art – his poetry, music, politics and ideas – his voice is arguably the musical’s most significant symbolic character. Tupac’s enduring significance to young people has not abated in the years since his death and has, perhaps, intensified as his cultural identity has evolved from popular folk hero to international cultural legend. Tupac remains a powerful figure in global popular culture, in part because he merged the hustler’s ideology and the poet’s ideation into a lucrative brand and into what seemed a seamless identity until his tragic death from gun violence, a death that haunts Hip Hop culture and is deliberately signified in the narrative of Holler; Holler reminds us that Tupac was a unique individual who lived an unusual life, but his death by gun violence was a common one for a young black men in America. Tupac fans in the audience will recognize Tupac’s words. Hearing them vocalized in a new narrative context resurrects them; it amplifies and elaborates their impact in ways that are emotionally moving and add layers of both beauty and grief to the story that Holler tells. Through Tupac’s words, the entire musical asks us to consider how many other unique, beautiful, and brilliant young black men – less famous but equally troubled and valuable – have died before their time; how many others who loved them have suffered. Holler If Ya Hear Me is also major contribution to the enduring but often marginalized traditions of both African American Theater and Hip Hop Theater. Holler represents a valuable addition to the second century of the black theater tradition in New York City and the third decade of New York, national, and international Hip Hop Theater. It is, also, the first major “juke box musical” and Hip Hop Theater production organized around the art of a single seminal artist. Aside from notable theatrical Off-Broadway productions such as Jam on the Groove (1995) and more recent Broadway productions such as (2008), which was nominated for thirteen Tony Award’s, and won four including Best Musical, Broadway and the mainstream theater community have largely ignored the global phenomenon of Hip Hop theater and so have many consumers of Hip Hop culture, who have focused on the more conventional hip hop art forms and genres. With the help of Tupac’s status as an international icon and its powerful performances and production, Holler If Ya Hearme may help Hip Hop Theater attract the attention and resources it deserves and enable the multigenerational tradition of black theater to attract and inspire the next generation of theatrical artists and audiences. Holler’s significance to black culture is indicated by the fact that Henry Louis Gates, Jr. the nation’s most powerful black academic and champion of the nation’s most well-endowed African American Studies Department traveled from the ivory towers of Harvard to the streets of Broadway for opening night. During the play’s intermission, I found myself complaining for a moment that we had heard versions of this story before in African American Cinema. The musical features echoes of Do the Right Thing’s themes of community conflict and racial dynamics and, in fact, Spike Lee attended the premiere. It has elements of Boyz in the Hood’s themes of brothers, friends, gunshots, and revenge, and Menace II Society’s themes of violence, drug dealing, and failed fantasies of escape from the “hood.” In fact, I wondered, haven’t we heard this story before in the music and poetry of Tupac himself? Before the second act began, I realized that I had heard versions of this story more recently and more intimately. I have heard versions of this story in my own family and over the last few months in the writing and presentations of my own students at CUNY City Tech, the majority of whom are brilliant young black men who have, in some cases, persevered in the face of violence and suffering to seek an education. We all hear racist, classist, and dehumanizing versions of this story on the news and the internet every day. Some white reviewers are dismissive of the narrative, finding it melodramatic, yet for many young people of color, the consequences of violence that privileged white people may consider “melodrama” remain an all-too-familiar and very real part of everyday life. So for those of us, including myself, who may ask, “Haven’t we heard this story before? Haven’t we already heard the story of senseless violence, and even more senseless death, of drug-dealing, and prison sentences, and, and misguided loyalty, and fractured families and friendships, and and regret, and grief, and love?” Holler If Ya Hear Me answers: “Yes. We have heard this story before, and we need to hear it again, and again, and again in new and compelling and creative ways. We need to see and hear this story until nobody, not one single working class or poor child of any race, is livingthis story any more. And, the musical adds, you have never heard this story told like this before, not in musical theater, not in Hip Hop culture, and not through the theatrically reinterpreted music of Tupac Shakur. So listen up. Hear this. Hear us. And Holler if you do!” In this sense, the familiarity of its narrative elements, which may initially appear to be a weakness of the musical, is really one of Holler’s strengths and an aspect of the play that has great potential to engage young audiences. I saw the 2004 Broadway production of A Raisin in the Sun – which was, also, directed by Holler’s director Leon – with an audience that included a large group of young people who may have been in high school or college and did not appear to be regular theatergoers. They were riveted by the play and responded with the same enthusiasm as the young man who loved Holler so much. A story that was nearly half-a-century old still spoke to their aspirations and lives. Holler has that same potential to engage the imaginations and experiences of young people. Fortunately, the producers of Holler If Ya Hear Me are attentive to younger people who are an important audience for the play. They have made the play more affordable than most Broadway fare and have commissioned Marcyliena Morgan and Nicole Hodges Persley of The Hip Hop Archive and Research Institute at­­­­ the Harvard University Hutchins Center to develop a curriculum for schools and communities. Attentive to the twitter generation, the playbill included inserts asking audience members to tweet/holler about #hollerbway. Holler If Ya Hear Me, asks us to hear a story of violence, redemption, and the quest for peace in a new way and in a new form. When the young black man with whom I spoke so briefly at the premiere of Holler If Ya Hear Me hollered that he “loved it,” I heard him. Perhaps he loved it because, like me, he found that in Holler If Ya Hear Me, black male humanity is performed with beauty, energy, dignity, power and joy. And that is definitely worth hollering about. Dionne Bennett, Ph.D. holds a doctorate in anthropology from UCLA and a B.A. from Yale University. She is an Assistant Professor of African American Studies at CUNY’s New York City College of Technology.